Let’s face it, there's nothing like seeing your slides projected on the big screen. Big screen? Yes, an actual folding screen that you set up in your living room in order to project images onto – be it, home movies or slides. Kodak reintroduced it’s Ektachrome E100D slide film this past year. It’s a color film that makes a color positive. When processed, have it mounted in a cardboard slide mount. This way you can either scan it or project it. To get all the “wow” from a slide, projecting it is a must! A few years ago slide projectors were a dime a dozen and during the “digital revolution” many fine machines went to the trash. If you do not have one ask an older member in the family if they do (they probably kept in with the hand crank for the Model T and the Victrola)! If not, here’s a history and some buying tips to help you get one today. 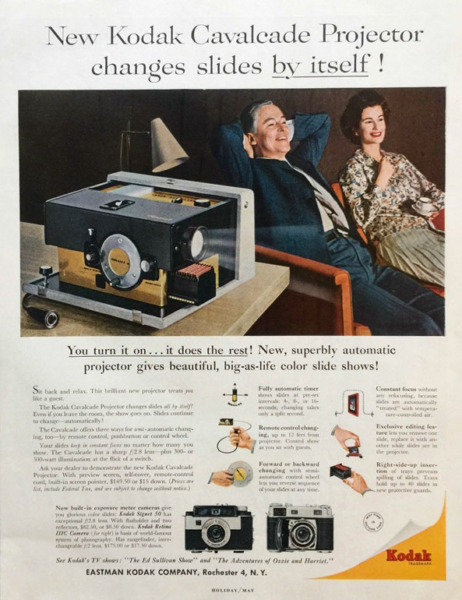 Kodak began making slide projectors in 1937. 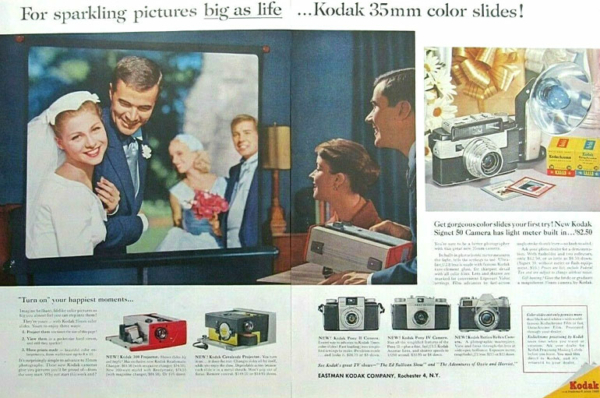 There were various versions of the KODASLIDE projector until 1958 with the introduction of the Kodak Cavalcade. This projector came in models like the 500, 510, etc and took a straight tray or an item called a Readymatic that held 36 stacked slides. The tray held 30 slides. Today trays and bulbs are hard to find, the bulbs are expensive and may only last 10 hours. Avoid Cavalcade models. 1961 saw the introduction of the Kodak Carousel - this was the first projector to use the carousel tray that is still used today. It was a “heat torching” 500 watt machine. I note this for later discussion. Did you know that if you project a slide too long it will absorb the UV from the lamp? It will bubble and blister like a sunburn... and like a sunburn, you do not know the damage is done until later on. In 1967 Kodak made a professional model of the Carousel and called it the Ektagraphic. It did neat things that the consumer version did not, like drop an internal dark slide between the lens and bulb if no slide was in the chamber. I called that feature the “retina saver”. This series, and later the Carousels, were all dropped to a cooler 300 watt bulb. The Ektagraphic is a more precise machine in that it dropped the slide in the projection chamber. This allowed use with dissolve units. Dissolve units control 2 or more projectors to overlay one image over the same area as the other projector. They gradually cut the light from one slide while the other projector’s slide was gradually increasing in brightness as they changed between the two units. The need to have both slides be in proper register was a necessity. Other differences included a replaceable lamp housing. You did not have to handle a hot dead lamp to replace it when the bulb blew out - just pop out the housing and slide a new one in, they changed in seconds (not minutes)! The body housings were made to hold exotic lenses, heavier than consumer ones but actually all the lenses were interchangeable. You bought lenses by the inch. I was known as Dr. Lazenby in my former film retail job, since all three of our offices would call me for lens recommendations. They would call and say, “Hey Doc, Chrysler is doing an install...conference room...96” square screen... distance from screen to projector is blah blah blah.” OK, you need a 6 inch lens, or a zoom 4 - 7 inch. and I would recommend a brighter lamp housing or a faster lens. Lenses came in different speeds; faster lenses sometimes need additional support. These folks thought I was brilliant but really I had this little sliding rule type thingy in my desk and I just dialed in the numbers and reported back. You will probably not have a choice of lenses if you buy a used projector but if needed, different ones can be bought. The shorter the inches, 2” for example, the closer you can get to a wall or screen and fill the screen or have a bigger picture. Models I would look for are Ektagraphic especially the III series, Ektalite series, and consumer Carousels in the thousand series like 4000, 4200, 5200, 5400, 5600. The higher you go up in the numbers the more options you will have, like auto focus. The projector is auto focus so any lens will work, the lenses have nothing to do with the auto focus feature. Even some of the earlier 750 and 760 are good units. They are a little tricky as they changed the lamp used during production. You do not want one that takes an older 75 dollar bulb (compared to an easy-to-find 10 dollar one). If you can check out the projector in-person look for one that takes a mushroom shaped lamp or a small almost barrel shaped. If it is longer like a fish tank lamp avoid it. Never touch a good lamp with your bare fingers, the oils remaining on the glass can cause an immediate blow out when turned on. If you touch it, clean it off with alcohol before use. When you are done projecting, turn off the lamp but let the fan run to cool the lamp down. You never want to move a projector with a hot lamp in it, it shortens the life or can cause a blow out. To test a projector, turn it on and cycle it forward or reverse, a black arm should come out and advance forward, like it is pushing the tray along. If it doesn’t move don’t buy it, the link arm assembly is not working and it will be cheaper to find another projector. You can buy the parts and repair this yourself at a cost of about $25. If you lift the projector and small shards of greenish glass drop out, it means the heat absorbing glass has shattered. It does exactly what its name implies, it absorbs the heat from the lamb and protects your slide from melting. It will still work but keep your projection to seconds, not minutes. And last but not least, trays. 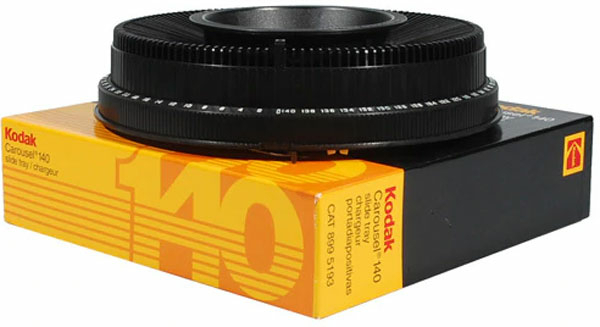 All modern Kodak projectors take carousel trays but not all-round trays are carousel trays, nor will they fit. Transvue 80 - holds 80 slides with nice wide slots for cardboard, plastic or even bent cardboard slides. The tray stores in a nice provided box. Transvue 140 - holds 140 thin mounted slide, no glass mounted, no damaged cardboard, just new cardboard and thin plastic. They will jam if the slide is damaged or too thick. They also come in that classic storage box. Ektagraphic 80 - the slots in this tray will take just about any slide you can put in it and not jam up, including the ultra thick glass mounted slides. The box also included a molded slot to store an audio cassette. Ektapro - This was an Ektagraphic tray that had a clear locking lid rather than locking ring. It was used for “permanent installations” to keep the dust from settling on the slides. One last projection device Kodak offered was an item called a stack loader, it was meant to project your slides without putting them in a tray, it stacked them on one side of the unit and collected them on the other side. Great for editing that fresh box of slides you just got back from the lab. 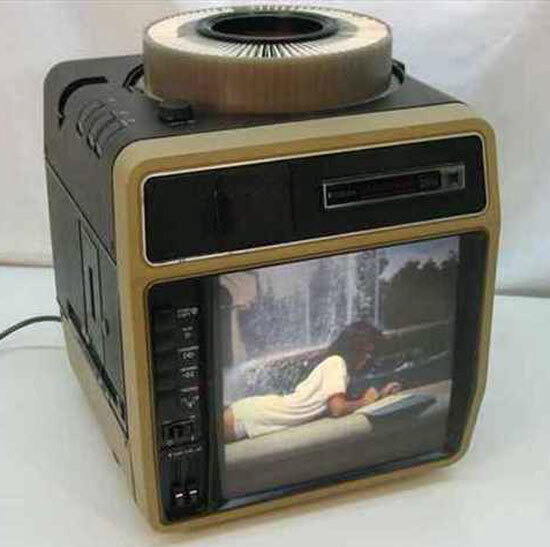 One other projector you might keep your eye out for is a big square monstrosity called a Kodak Audio Viewer. It had a built in 10”x10” screen, the Carousel tray fit on top and would project on its internal screen or on a full size screen. The internal screen in like a TV screen. You could also make an audio tape with voice and /or music, then record the proper hertz pulse and the projector with display your show unattended. Big, bulky, but no screen is required, the picture is not as nice as a traditional projected image. I remember seeing real estate places leaving these running 24/7 in their business windows to advertise homes available. 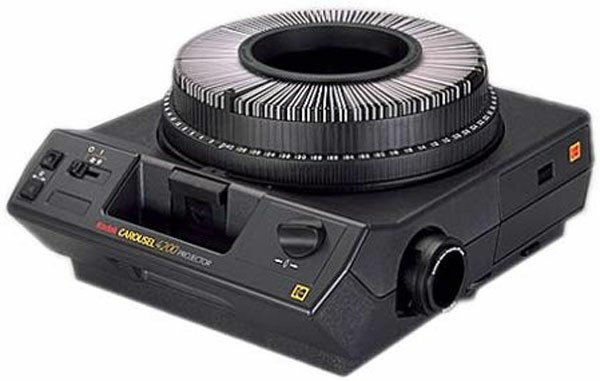 You probably noticed I only talked about Kodak slide projectors and there is a reason for that. They were by far the king of consumer and professional projection equipment for 35mm, 126, 127 super slides and 110 slides. Bell and Howell, Airequipt, Argus, Yankee and others made projectors but most of them used a dedicated tray that was not interchangeable with the Kodak trays. If any place carried a small line of photo goods, they carried a Kodak tray. It goes without saying they are the most abundant today and for the most part the easiest to find parts for. There you have it, shoot some glorious slide film, pop some corn, invite the neighbors over and show some slides. Your dad would be proud. Leslie Lazenby fell in love with photography when she was given her first camera, a GAF 126, at the age of 10. 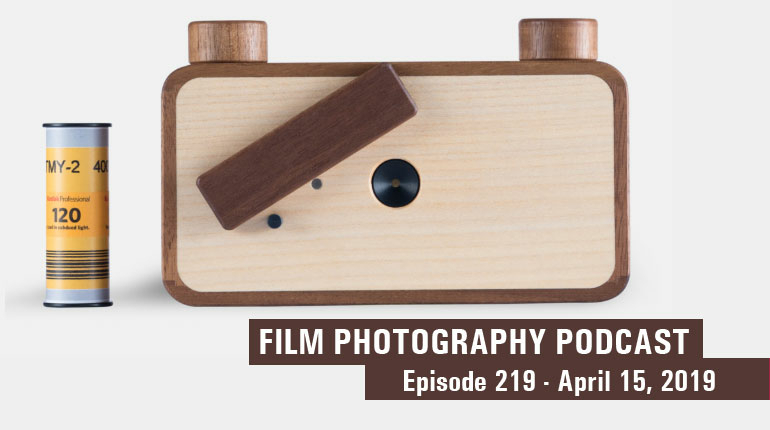 Her first job in a camera shop with a custom and commercial photo lab turned into a 20-year adventure in film; leading to positions in darkrooms, customer relations, and as head of purchasing. For the past 15 years, Leslie has owned her own business, Imagine That, retailing traditional photography products, photographic restoration, custom printing and video conversions. She finds her Zen next door at her studio, the Mecca, where she plays with her film cameras, processes film and holds small classes focusing on teens and young adults. You can find Leslie's photos on her FLICKR account!